Yes, I consult runes and tarot cards. Not daily mind you, but sometimes once a week, more confirmation of intuitive guidance. Divine inspiration directs the path. I am a perpetual student of life. Always imaginative, I am equally captivated by larger-than-life contemporary art as the delicate pink peonies in our garden. Each neighboring detail has meaning – color, texture, the mix of elements. Inspiration can be found everywhere, and I always use it creatively in beads I shape, articles I write, the food I prepare. As a designer, I am always creating. Everything talks to me. Yes, that’s precisely it, Donna! Jewelry is like life, all about balance. It is an ongoing lesson, discovering new combinations that work effortlessly, others requiring time and patience to get just right. I aim to blur the distinction between current and classic, to keep jewelry fresh and on-trend, wearable, and artfully combined. My favorite piece is always the one just finished. Constantly refining my skills, I study new techniques and test original materials to mix it up, adding creative spirit. I am as diverse and unique as the jewelry I create. I’ve always drawn pretty pictures. My kindergarten teacher predicted I would “do well in an artistic field” as an adult. At fourteen, A Midsummer Night’s Dream became a reality when asked to sketch and create all the costumes for a children’s production of the Shakespeare classic. A bit daunting was the task, not because I lacked confidence, but at the time I didn’t own a sewing machine. It was a good thing I knew how to thread a needle. Four years at New York’s Fashion Institute of Technology and two degrees later, knitwear became a cozy niche for twenty-five years, designing for Catharine Lover, Carlos Arias, and the Anne Klein license under Colette Mordo. Today, I am married over twenty years with a daughter in college, and navigating a successful career as a jewelry designer and entrepreneur. With flameworking glass, I instinctively adapted to the craft. Now each creation takes on new meaning for one of a kind. Each glowing piece is a reflection of the individual who will wear them – colorful, intriguing, complicated, sophisticated, chic. I want every customer to feel this was made for me. 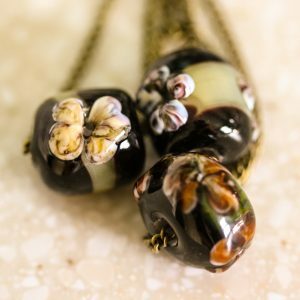 Jewelry is taken to the next level of originality, lampworking my glass beads to coordinate with Deux-coupage™ pendants and custom metal stamping. Images, glass, and words connect… complementary, cohesive and creative. Melting rods of colored glass, twisting, blending, dotting, and swirling the colors to create unique novelties is very meditative. Goggled eyes and busy hands must focus on the size, shape, and hues all while working in a hot flame. The softened glass can be manipulated in many different ways, numerous planned techniques in just one bead, yet sometimes the result is a glorious surprise. Hot colors look different in cooled completion, but the individual beauty reveals exceptional vibrancy. Revisiting period craft with a modern twist spawns a new age of art to wear. In French, Deux means two; coupage is to cut. Deux-coupage™ is an old-world craftsmanship technique renewed with a contemporary spirit. 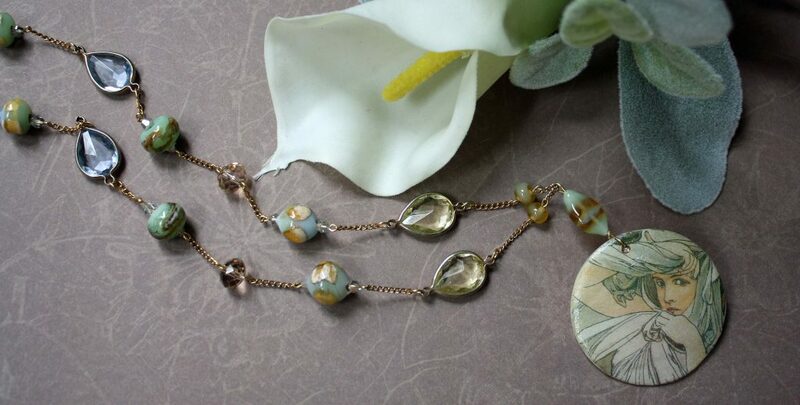 Each pendant or focal piece boasts two sides, one a captured image carefully transferred by hand, the reverse reflecting natural elements of stone or mother of pearl. As with classic decoupage, images begin as paper cut-outs and are covered in several layers of transfer medium to seal it. Once dry, the clipping is soaked in water to soften the back layer of paper so it can be removed gently to reveal a semi-transparent image. 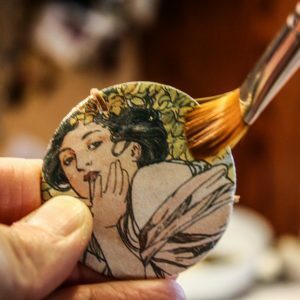 The image skin is dried again then applied to mother of pearl, stone or metal with the particular adhesive, and later sealed with multiple coats to secure the finished piece. This process is time consuming, but the result resembles fine painting or inlay work, a glorious example of true decorative art to wear. Metal stamping by hand empowers me to produce fresh prose, free to fashion endless intentions, adding new significance to each piece of jewelry. Every necklace is authenticated with a signature S logo charm. To attain this mark, I first acquired a set of metal punches, solid anvil and lots of different metal blanks. Everyone has a hammer, right? Stamping is kind of like the story of the three bears… Hitting with the hammer can’t be too hard, or it will bend the piece; too soft will not create an even impression, but just the right amount of pressure produces an impression that is clear and deep enough to read. Practice makes perfect and once you get the hang of it, such fun!